Digital FilmMaker is the one-stop resource for filmmaking, editing, post production and more. Regular features include: interviews with pros from the film industry, Q&A sessions, equipment reviews, tutorials, film reviews and competitions. 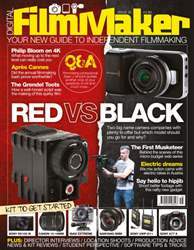 In issue 16; Red or Black - which should you go for and why, Behind the scenes of the micro budget web series The First Musketeer, Say Hello to Hipjib, We mix action cams with Electric bikes in Austria, Philip Bloom on 4k, The Grendel Toots and how a well honed script was key to it's success, plus gear reviews, news and more. You'll receive 11 issues during a 1 year Digital FilmMaker magazine subscription. If you produce or perform in independent film this is a great monthly resource to find out what is on trend and who is up and coming in the everyday world of filmmaking. 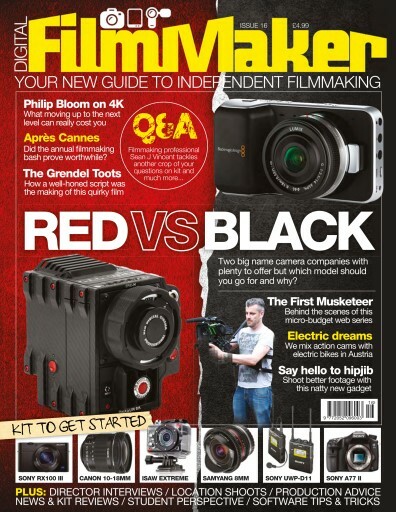 This magazine is superb, packed with useful and inspirational articles and advise that has really helped me to forge a career in the film industry. Money well spent. This mag just gets better and better. The digital format works a treat for the subject matter and the content, layout and design are awesome. This is also incredibly cheap for what you get, which is 116 pages of top advice. Buy it! I have only just come across this through a friend and it is an amazing find. As a budding film maker this is so helpful. Useful hints and tips and fab interviews. The makers of this magazine obviously know their stuff. You'll receive 11 issues during a 1 year Digital FilmMaker magazine print subscription.